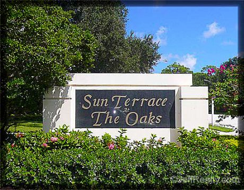 Sun Terrace at the Oaks townhomes are situated in Palm Beach Gardens. These gated community villas are one of the most established subdivisions in the area with have gorgeous lake and garden views for a park like setting feel. Oaks lined streets give Sun Terrace at the Oaks a proper name. Divosta built Sun Terrace at the Oaks in the early 1990’s. 480 units in all are wrapped around the lakes and gardens. Divosta used their signature concrete construction when building these homes. 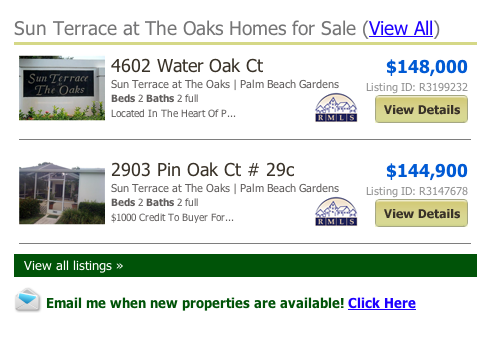 Sun Terrace at The Oaks Townhomes online now. All listings & Sold Statistics! All have large screened lanais and open great room floor plans. The locale is ideal and adjustment to the Palm Beach Gardens Hospital and just minutes from the Palm Beach Gardens Mall. Sun Terrace Homeowner Association fees are low for the area community and the villas are extremely well built. The association handles many of the amenities including lawn care, building insurance, cable, and common area. Pets are welcome but there are some restrictions. Posted in palm beach gardens homes, Uncategorized on June 25, 2011 at 9:07 pm.